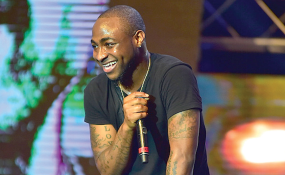 As Nigerians prepare to vote on Saturday, singer Davido has been forced to publicly declare support for colleague Banky W who is vying to represent Eti-Osa constituency. Davido was pressured by fans to declare whether he was supporting Banky W, five days to the election. The singer was lecturing his fans via Twitter to participate in the upcoming elections to ensure good leaders get to office. A fan wrote back; "Perhaps you should at least voice your support towards the candidacy of @BankyW it'll be a good way to start. God bless." To that Davido responded; "I am supporting @BankyW ... "
Nigerian artistes have been accused of not showing support to their colleague who is vying for political office. Banky W had to fundraise for his campaign through a concert on Sunday, where Davido was nowhere to be seen. Davido had previously been roasted for only supporting his uncle who is vying for a governorship seat.